The suburb of Naremburn was among the first settled areas of the Willoughby LGA. The origin of its name is unknown, but it was also known as Central Town, Dog Town, Pension Town and Struggle Town: terms that reflected its working class character of the times. It is locate to the south of formerly deep Flat Rock Gully and adjoins the North Sydney LGA. Small land grants in the area were settled from 1853 and there was rapid residential development from the 1880s, primarily comprising modest workers’ cottages. A range of small shops were established in Central Street, Slade Street, Wilson Street and Garland Road during this period. With the arrival of electric trams through the suburb in 1896, a new shopping centre was developed on the western side of Willoughby Road in 1907. Local industries included quarries, plasterworks, piggeries, dairies and slaughterhouses. In the late 19th century, sandstone from local quarries was shipped to building sites from a wharf on Long Bay. The brickworks at Gore Hill were provided employment for many Naremburn men, while the firm of Davis & Bunyan Limited established the Cascade Cordial factory at 186-188 Willoughby Road in 1927. St Cuthbert’s Anglican Church, opened in 1883 at 53 Market Street, was the first in the area, followed by the Congregational Church on the corner of Glenmore and Quiamong Streets in 1907. St Cuthbert’s was replaced by a new church on the corner of Willoughby Road and Merrimburn Street in 1916. The larger St Leonard’s Catholic Church on the corner of Willoughby and Dallys Roads opened in 1913, but its grand spire was not completed until 1955. The present Flat Rock Bridge spanning the creek of that name, which demarks the boundary with the suburb of Willoughby, was built in 1886. It still carries traffic along Willoughby Road today. 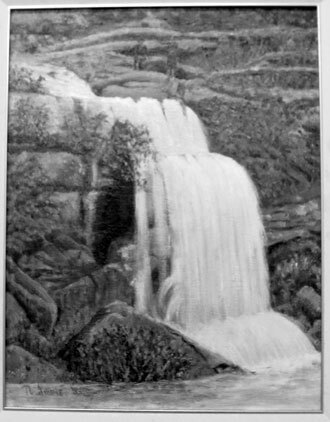 This painting of Naremburn Falls by Naremburn artist Nigel Imrie is based on a 1905 photograph of the falls after heavy rain. It was commissioned by the Willoughby Museum and forms part of our collection. Eric Wilksch, a prominent Naremburn resident from 1950, spent long hours in Flat Rock Gully recording, collecting and photographing the indigenous flora. His records, now held by Willoughby City Library, provide a valuable documentation of the local flora at this time. 1 Don Soper, interview by Judy Peters, 15 February 2011. 2 Eric Wilksch, The Naremburn Story, Chatswood, Willoughby Municipal Council, 1988, pp 24 and 28.